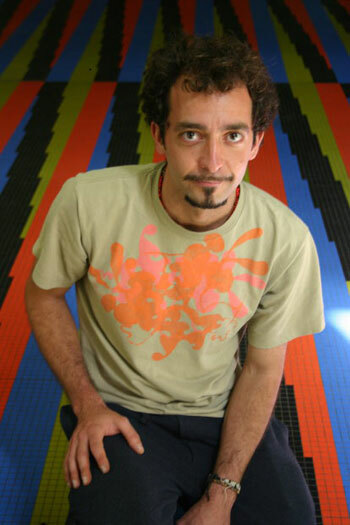 Whitney Art Works is pleased to announce an artist talk with London-based, Venezuelan artist Jaime Gili. The talk, to be held at Whitney Art Works on Saturday May 9th, at 1 pm, dovetails with the group exhibition Stratum on view through May, and a highly anticipated, massive public art undertaking, the painting of the 16 Sprague energy tanks in South Portland. Gili created the winning tank design in the Art All Around™ international design competition sponsored by the Maine Center for Creativity. His designs will begin being applied to the tanks this spring. Highly influenced by city environments and the tradition of urban public art in South America, Gili's optical designs for the tanks are meant to be seen from the road, the sky, and on Google Earth. This all-encompassing energy is just as dynamic in Gili's paintings. The vectored splashes of color bursting forth are a refreshing and bold take on the complex urban, and structural themes of Stratum. Gili has been profiled by Artforum and various other publications. He is also a frequently contributing art reviewer and essayist for the publication LAPIZ. He is represented by the gallery Riflemaker in London and will be included in the Saatchi Gallery-mounted exhibition Newspeak: British Art Now, on view at the State Hermitage Museum in St. Petersburg, Russia, beginning October 2009. Stratum will be on view at Whitney Art Works May 6 - 30. An opening reception will be held on May 8 from 5-8 pm. Whitney Art Works is located at 492 Congress St. Portland, Maine. Gallery hours are Wednesday - Saturday 12-6 pm and by appointment. 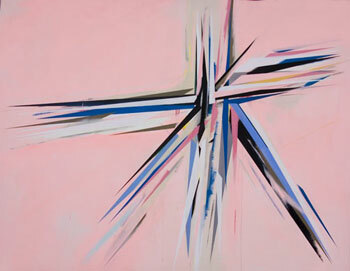 Jaime Gili, Eichner, 2007, acrylic on canvas, 106" x83"